Lord Jesus, please open our hearts and minds to receive the wisdom of the ages past when you first anointed and appointed men to carry on your work on Earth, through the anointing of the Holy Spirit. Amen. Well, my beloved family of Heartdwellers, it is time once again to move up the mountain and embrace the words of Jesus, that many have denied and labeled as heresies. But the Scriptures do not lie. So, let's proceed and see what they have to say about forgiveness of sins through an appointed, ordained servant of God. And as we do so, let us examine how the Early Church interpreted and practiced the Scriptures. Now, in order to do this, I had to pull up some kind of objection, the things that I've typically heard in ministry for years and years and years. Interpretations of the Scriptures that were twisted to deny the fact that the Lord instituted the sacrament of Confession. So, I'm going to go ahead and read from a source. I'm not going to bother to mention what the source is, but I'm going to read what represents the general attitude from the churches that don't follow the Early traditions of the Apostles. The Evangelical, Pentecostal, Baptist - all the different churches that have a totally separate belief system. This is commonly what I've heard. "The concept of confession of sin to a priest is nowhere taught in Scripture. First, the New Testament does not teach that there are to be priests in the New Covenant. Instead, the New Testament teaches that all believers are priests." First Peter 2:5-9 is what he cites. This describes believers as a "holy priesthood" and a "royal priesthood." Revelation 1:6 and 5:10 both describe believers as "a kingdom of priests." Okay - that's the statement. And this is false. And here's why. First of all, the Presbyter and Priest. Those words were used synonymously. How could there be any order in a church without a pastor, leader, teacher someone to administer the sacraments? These were appointed by the laying on of hands, and breathing, to receive the Holy Spirit. "The English word "priest" is derived from the Greek word presbuteros, which is commonly rendered into Bible English as "elder" or "presbyter." But that's not accurate. A Presbyter is a Priest. The ministry of Catholic priests is that of the presbyters mentioned in the New Testament (Acts 15:6, 23). The Bible says little about the duties of presbyters, but it does reveal they functioned in a priestly capacity. They were ordained by the laying on of hands (1 Tm 4:14, 5:22), they preached and taught the flock (1 Tm 5:17), and they administered sacraments (Jas 5:13-15). These are the essential functions of the priestly office. So, wherever the various forms of presbuteros appear--except, of course, in instances which pertain to the Jewish elders (Mt 21:23, Acts 4:23) --the word may rightly be translated as "priest" instead of "elder" or "presbyter." That definitely disagrees with this gentleman's idea that there was no word for priests in the New Testament, that they didn't exist. They were the Presbyters. "In the Old Covenant, the faithful had to approach God through the priests." No, that's false. In the old covenant people could approach God directly in prayer, but the priest was the only one who could offer the sacrifice for their sins, in the Holy of Holies. Jesus tore that veil when He paid for our sins, but He continues to ask us to carry our Simon's cross as a fast offering for the good of others. And He even gave us the injunction to carry our cross. So, here Paul is stating that he desires that we stand before God and offer prayers, supplications, intercession for all men. This truly is the work of restoring men to God, the entire purpose of the priest. Next, he is stating that only one is the mediator (and redeemer) of man--and he is qualifying that in the context of salvation and paying the price for our sins. Redeemed, as if in a transaction, paying the price to free the slave. He goes on to explain that the mediating of Christ was to pay for our sins. That in no way infers that we should not pray for others to be freed of their sins through the Name of Jesus. So, it's obvious here that there is some confusion in people's minds about what it means to be the one Mediator. Because anyone who prays for anyone else is a mediator! We stand in the gap. And we're told so many times in Scriptures to take that position. Stand in the gap. Pray for one another. We're also taught to sacrifice for one another - even as the Lord sacrificed Himself for us. Whereunto I am appointed a preacher and an apostle, (I say the truth, I lie not,) a doctor of the Gentiles in faith and truth." So, here Paul is declaring that appointment from God to his person to be a preacher - a minister of the Gospel, one whom God has ordained and called out from the general body of Christ, the general priesthood of the Elect, to be an apostle and teacher. The author states, again, "the concept of confession of sin to a priest is nowhere taught in Scripture." And that's a precursor to the new priesthood that the Lord appointed when He breathed on them and said, "Receive the Holy Spirit. Whose sins you forgive, will be forgiven." John the Baptist was a precursor to that. That was in the book of Acts, and it had to do with people who were practicing magic. And they burned all of their books and scrolls that had to do with that. And they repented. So, the thing we most often hear, as an objection to the priesthood is we are to confess our sins to God (1 John 1:9). Well, yeah - we confess our sins to God. But there's another dimension to that. You can take it in the 21st or 22nd Century culture. But you need to go back to the New Covenant that the believers in the Early Church practiced. How did they interpret this? And this was the line I brought up earlier. This is the scripture Evangelicals hang their hats on to discredit the priesthood, and confession to a priest. Well, what is a mediator? A go-between, negotiator, conciliator, peacemaker, go-between, middleman, intermediary. What is that? That's someone who stands in the gap, again. So, when we pray for another soul, what are we doing? Are we not standing in the gap and petitioning God for mercy, pardon, justice, and healing? So, one who prays for another is a mediator between God and man. He goes THROUGH Jesus. But still, he is a part of the mediation. How many times have you experienced, when someone prays for you, that there's a breakthrough and you finally connect with the Lord? So, this is a very basic teaching that has been twisted to exclude the intercession of the saints and the forgiveness of sins as a sacrament. And confession. Pray ye one for another. One who prays for another is a mediator between God and man, who also approaches God in the Name of Jesus. The Lord has commissioned us to pray for and exhort one another. When we do this according to God's will are we not standing in the gap for the other soul? Of course, we are. So, let's stop insinuating no one but Jesus can pray for us, no one but Jesus can ask favors of God. No one can fast and pray for us, for a breakthrough. And no one can forgive sins. Didn't the Lord give us this power when He said, "Teach ye all nations; baptizing them in the name of the Father, and of the Son, and of the Holy Ghost. Teaching them to observe all things whatsoever I have commanded you:" Matthew 28:19-20 And let's stop saying no one but God can forgive sins. Does that sound familiar? AND again, he entered into Capharnaum after some days. And it was heard that he was in the house, and many came together, so that there was no room; no, not even at the door; and he spoke to them the word. And they came to him, bringing one sick of the palsy, who was carried by four. And when they could not offer him unto him for the multitude, they uncovered the roof where he was; and opening it, they let down the bed wherein the man sick of the palsy lay. Which Jesus, presently knowing in his spirit, that they so thought within themselves, saith to them: "Why think you these things in your hearts? Which is easier, to say to the sick of the palsy: Thy sins are forgiven thee; or to say: Arise, take up thy bed, and walk? But that you may know that the Son of man hath power on earth to forgive sins, I say to thee: Arise, take up thy bed, and go into thy house." I find it very interesting that the very things Jesus presented as beliefs of the New Covenant, met with such resistance in His day and even in our day by some denominations. The Apostle likewise bears witness and says: ... "Whoever eats the bread and drinks the cup of the Lord unworthily will be guilty of the body and blood of the Lord" [He's quoting from 1 Cor 11:27]. But the impenitent spurn and despise all these warnings; before their sins are expiated, before they have made a confession of their crime, before their conscience has been purged in the ceremony and at the hand of the priest...they do violence to his body and blood, and with their hands and mouth they sin against the Lord more than when they denied him. Indeed, he but sins the more if, thinking that God is like man, he believes that he can escape the punishment of his crime by not openly admitting his crime....I beseech you, brethren, let everyone who has sinned confess his sin while he is still in this world, while his confession is still admissible, while the satisfaction and remission made through the priests are still pleasing before the Lord. Well, that's certainly a very different interpretation! That confession, the sacrament of confession, than what is offered to us by Evangelicals. This is a whole different perspective. And this is the perspective in 250 AD of the Early Church. It is necessary to confess our sins to those to whom the dispensation of God's mysteries [that is, the Sacraments] is entrusted [that is, the priests]. 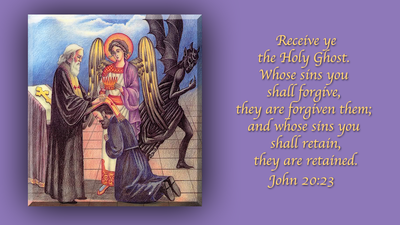 Those doing penance of old are found to have done it before the saints. It is written in the Gospel that they confessed their sins to John the Baptist [Matt 3:6]; but in Acts they confessed to the Apostles, by whom also all were baptized [Acts 19:18]. Let this be in the heart of the penitent: when you hear a man confessing his sins, he has already come to life again; when you hear a man lay bare his conscience in confessing, he has already come forth from the sepulchre; but he is not yet unbound. So, what he's saying here, is he's coming forth out of the grave, but he's still bound in the grave clothes. Yet those who do penance in accord with the kind of sin they have committed are not to despair of receiving God's mercy for the remission of their crimes, however serious. Iniquity, however, sometimes makes such progress in men that even after they have done penance and after their reconciliation to the altar they commit the same or more grievous sins....and although that place of penance in the Church is not granted them, God will not be unmindful of His patience in their regard. There have been those who would say that no penance is available for certain sins; and they have been excluded from the Church and have been made heretics. Holy Mother Church is not rendered powerless by any kind of sin. And that's from Augustine of Hippo. But what was impossible was made possible by God, who gave us so great a grace. It seemed likewise impossible for sins to be forgiven through penance; yet Christ granted even this to His Apostles, and by His Apostles it has been transmitted to the offices of priest. Just as in the Old Testament the priest makes the leper clean or unclean, so in the New Testament the bishop and presbyter or priest binds or looses not those who are innocent or guilty, but by reason of their office, when they have heard various kinds of sins, they know who is to be bound and who loosed. That's interesting. Can you imagine the people in a church coming to confession, and confessing their sins. And the priest gets the whole dynamic of what's going on in the church. Who is responsible for what. And is given a good look into what the remedy might be. And you know - we're not talking about having a parish or a large congregation. This is more for family home groups. The way the Lord wants to restructure the churches in very small groups. Tiny home groups, not great big congregations with 500 people. But several home groups in a town or city. And what an advantage it would be to the priest, to know what were the dynamics behind the sin that was created. I mean, that's... It would give him a lot of insight into what's going on. And of course, there's always, always a possibility of corruption. But when the Lord returns, that won't be even possible. Because we'll be governed by Him and His saints and His angels. This is the medicine for sins, established by God and delivered to the priests of the Church, who make diligent use of it in healing the afflictions of men. You are aware of these things, as also of the fact that God, because He greatly cares for us, gave us penitence and showed us the medicine of repentance; and He established some men, those who are priests, as physicians of sins. If in this world we receive through them healing and forgiveness of sins, we shall be delivered from the judgment that is to come. It behooves us, therefore, to draw near to the priests in great confidence and to reveal to them our sins; and those priests, with all diligence, solicitude, and love, and in accord with the regulations, will grant healing to sinners. The priests will not disclose the things that ought not be disclosed; rather, they will be silent about the things that have happened, as befits true and loving fathers who are bound to guard the shame of their children while striving to heal their bodies. That's beautiful. And reminds me so much of the Desert Fathers, who always rush to cover the sins of others. Priests have received a power which God has given neither to angels nor to archangels. It was said to them: "Whatsoever you shall bind upon earth shall be bound in heaven; and whatsoever you shall loose, shall be loosed." [Matt 18:18] Temporal rulers have indeed the power of binding; but they can bind only the body. Priests, however, can bind with a bond which pertains to the soul itself, and transcends the very heavens...Whatever priests do here on earth, God will confirm in heaven, just as the master ratifies the decision of his servants. Did He not give them all the powers of heaven? "Whose sins you shall forgive," He says, "they are forgiven them: whose sins you shall retain, they are retained" [John 20:23]. The priests of Judaism had power to cleanse the body from leprosy -- or rather, not to cleanse it at all, but to declare a person as having been cleansed. And you know how much contention there was even in those times to obtain the priestly office. God has given to priests powers greater than those given to our parents; and the differences between the powers of these two is as great as the difference between the future life and the present....Our parents begot us to temporal existence; priests beget us to the eternal. The former are not able to ward off from their children the sting of death, nor prevent the attack of disease; yet the latter often save the sick and perishing soul -- sometimes by imposing a lighter penance, sometimes by preventing the fall. Great is the dignity of priests. "Whose sins you forgive," He says, "they are forgiven them." The things that are placed in the hands of the priest, it belongs to God alone to give.... Neither angel nor archangel is able to do anything in respect to what is given by the Father and Son and Holy Spirit Who manage it all; but the priest lends his own tongue and presents his own hand. Nor would it be just, if those who draw near in faith to the symbols of our salvation were to be harmed by the wickedness of another. Lord, have You something to add? Jesus began, "I have much to say to My precious ones. There are many reasons I gave this authority over to My priests, more than I could enumerate here. This is a gift of freedom. Freedom from guilt, false or true. "It was never meant to be institutionalized. No, this was to be a time of intimacy and healing for the hurting soul. For in truth, sin hurts the soul and deprives it of sanctified life. "My heart is to free each of you from sin immediately when you have recognized and repented of it. This is the main concern. Taking it to a priest who has only your healing in mind gives them the opportunity to share wisdom and insight from My Holy Spirit, so that the sin is not repeated. "Yes, I know it is difficult for you to reveal your shortcomings to any man. But this also brings you into the realm of humility, without which you will not enter Heaven. This happens when you confess to a priest or to a group. It brings you down to the level of all humanity and engages others in following your example and learning from you. "To see and understand your struggles is to allow others to deal with their struggles. Continuously, Satan is accusing all of you and trying to make you feel like you alone are the reprobate and there is no hope, as if everyone around you is perfect. "The moment you open up to another, I fill you with a new grace, a certain humility that frees you from having always to be right or perfect. You are, in those moments, confessing who you are before God and who you are not. This helps to deliver you from the social games of self-righteousness. You can live and breathe freely; you are no longer pressed into proving how superior you are. You are accepted by Me and by the minister, having now been cleansed by My Blood. "This is a sacrament--that is, a help to bring you to Heaven, standing clean before your Savior. As such, a certain grace is imparted to strengthen you, so you do not repeat the same sin. It is as if you were in jail. I came, unlocked the door and said, 'You are free now...go and sin no more.' And with those words My grace accompanies you, leading you away from occasions of sin and into a new, more productive way of feeling and living. "The absolution from a priest is a mighty gift to deliver you from the grave clothes of sin. Please do not despise nor reject this gift. It is My gift of love and freedom to you. "I bless you now, My Precious ones, with a portion of My Mind and Heart that you might walk in the fullness of holiness I have called you to."